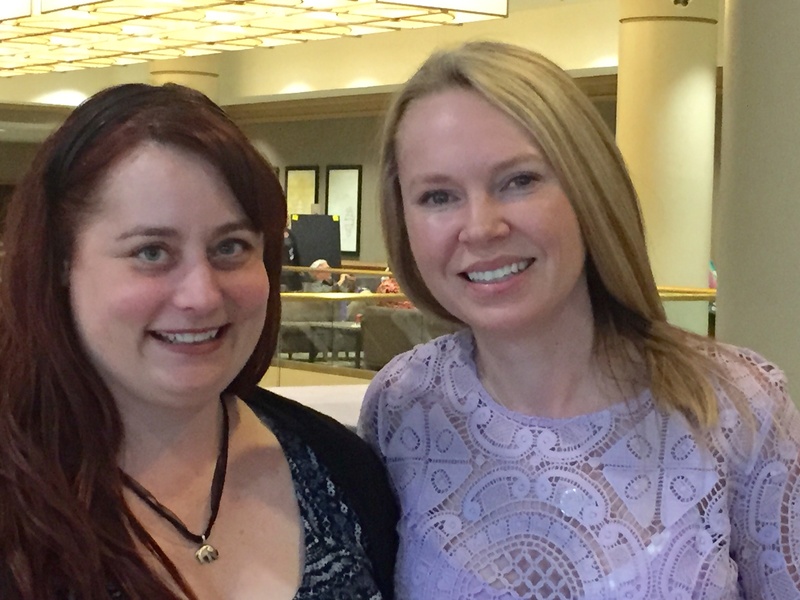 I attended the annual Handcrafted Soap & Cosmetic Guild Conference last weekend. Even though I was there less than two days, it was full of hugs, geekin’ out on soap talk and hours of testing. Because of our recent housing challenges, I had to cut the trip early and fly home before the conference was over but I would do it again in a heartbeat. The learning sessions I attended were all top notch and the laughter in between sessions was heartfelt and supportive. It was so fun to meet soapers from around the country! The speaker highlights of my 36 hours in Indianpolis were Lela Barker and Kevin Dunn. Both have been leaders in the soapmaking industry from slightly different ends of the spectrum. 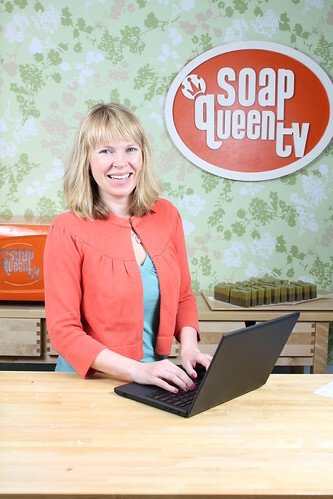 Kevin is completely technical soapmaking and Lela is about the business angle of soap. They were great foils to one another. Kevin is a college professor that conducts experiments on soapmaking questions every year, using his students to do much of the research. He spoke on the importance of being able to determine the purity of your lye. To do so, he demonstrated how to titrate sodium hydroxide, on stage (! ), twice. He also discussed pH in cold process soap and what was possible to achieve with a traditional lye+oil recipe. He was hilarious and had the crowd laughing many times. Lela from Lucky Break Consulting and Bella Lucce gave a killer session on branding. She is a hilarious speaker (really, her one-liners rival any stand-up comedian) and more importantly, her talk was chock full of helpful information that could be implemented right then and there. 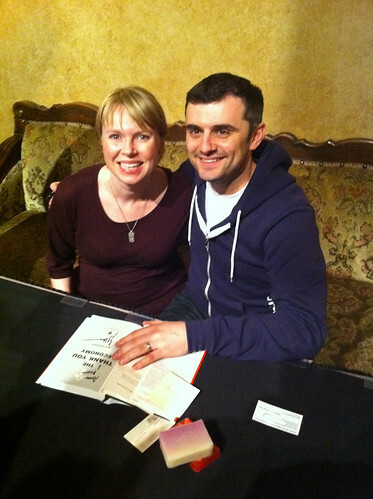 She recommended reading the book, “The Fortune Cookie Principle” several times during her talk. Curious about her talk? She has a rock-solid blog here with an entire section on branding + strategy, including a recently published piece on building a press kit. Listening to Lela Barker talk about branding and strategy is always a treat! 1. 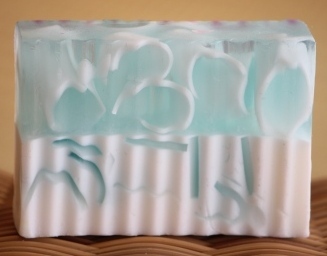 A research paper – I submitted my Soap Crafting book for this portion. It fit the bill of expanding and educating the industry. 2. A topical paper – I wrote about labeling laws in the United States and how cosmetic, versus drug, versus soap labeling laws differ. 3. A 3 hour essay test – This had fun questions such as, “How is stearic acid made? What are the grades of stearic acid? How do they differ?” and other such delightful and challenging queries. 4. 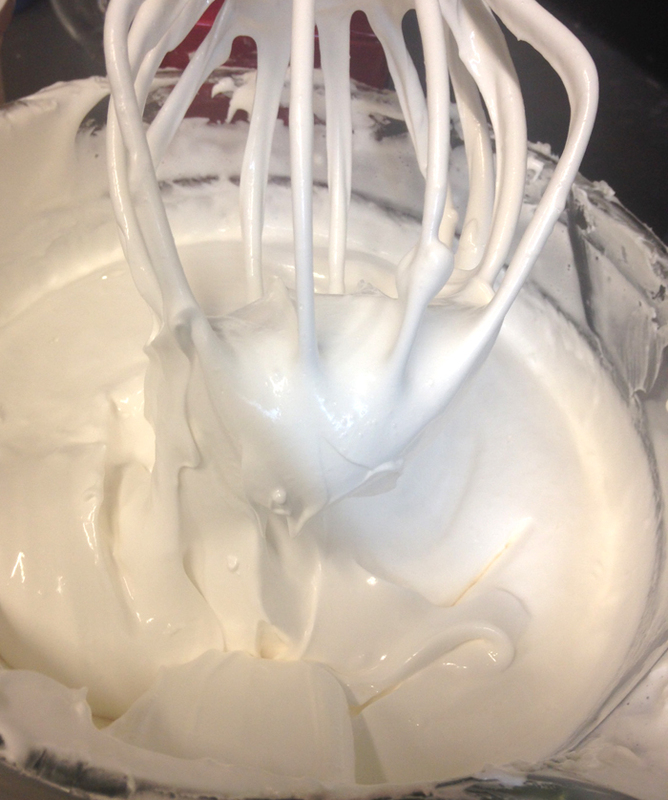 Seven soap samples + accompanying paperwork – This took months and months and months to do; everything from making my own lye from scratch to mastering the art of making whipped soap, this was by far the most labor intensive part of the test. The test involved making lye from scratch. The water reacts strongly with the wood ash. It was a nail biter until the end but at the annual meeting for the Guild, I was awarded my certificate. It felt good to know that two years of labor and effort was for the win. 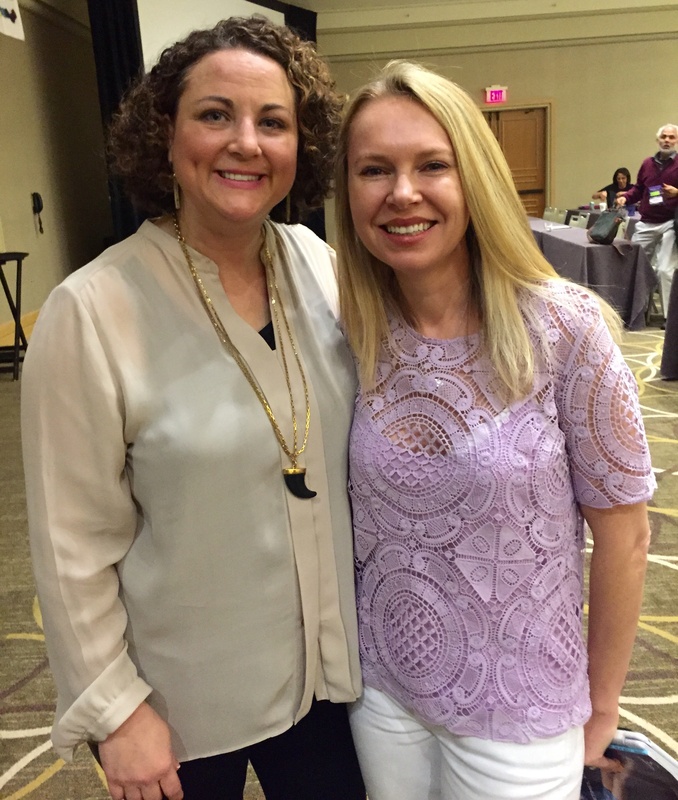 I had a soul-filling, laughter-inducing time at the Annual Soap Guild Conference. I came away inspired and enlivened by all the people I met and hugged. It was awesome…just awesome. 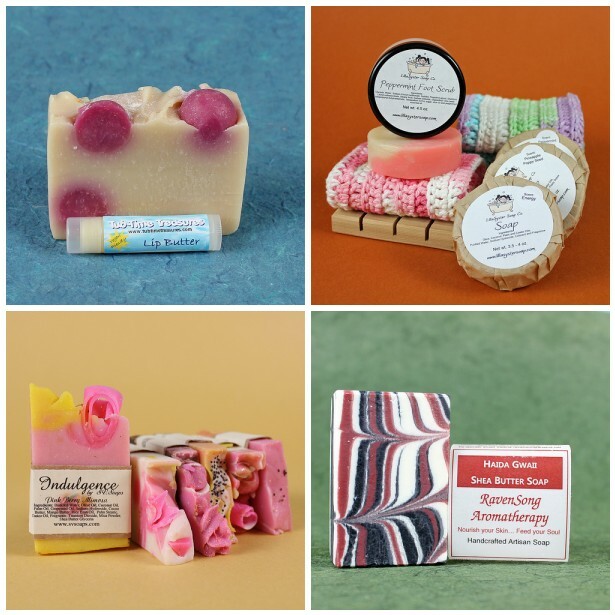 Back in May, the Bramble Berry team and I road tripped it down to Portland, Oregon for the annual Handcrafted Soap Guild Conference. 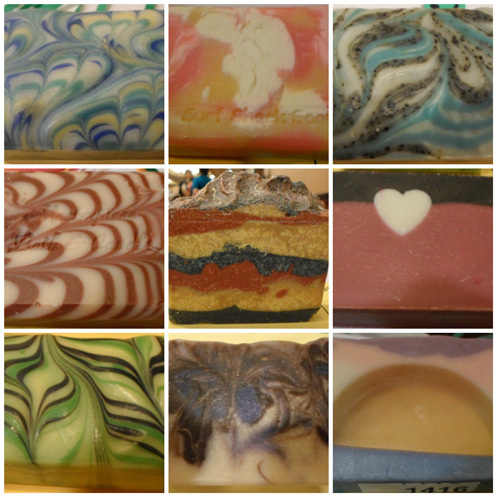 Check out two posts about the fun that we had and drool over some beautiful soap that was entered into the Soaper’s Showcase: Soap Guild Fun and Inspiring Soap Mosaic and Post Guild Report and Catch Up. It was inspiring, entertaining and rewarding to meet Bramble Berry’s customers in person and see what they create with our raw materials. I just wanted to give a shout out to some of our sweet customers that brought us goodies to take home from the conference. You spoil us! 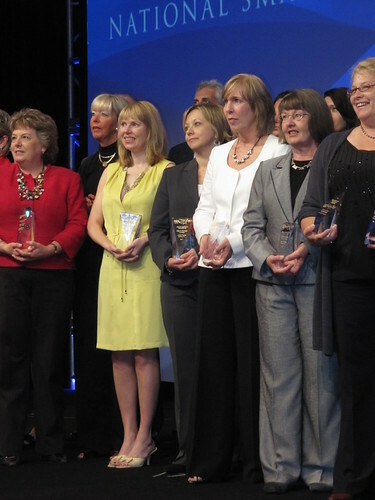 A couple years ago, I spoke at Women’s Leadership Northwest. It was an excellent event. You can read my blog write up here. 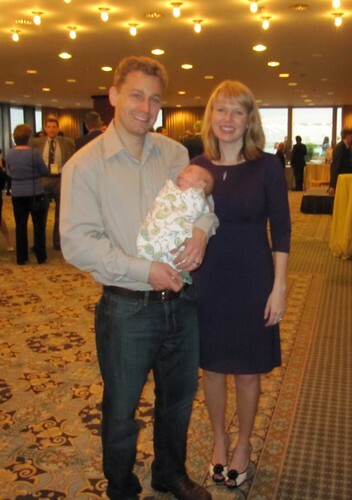 I attended last year (hugely pregnant – I’m pretty sure I was 3 weeks out from my due date!). It was a wonderful growth opportunity for me last year. If you’re in the Pacific Northwest, you should definitely attend the Women’s Leadership Summit on Saturday, May 19. If you can’t go, not to worry, you can watch from afar using the Twitter Hashtag (Twitter hashtag is #2012wls) or on Facebook. I’m bringing you a little Shandel magic below as well. Shandel Slaten is the coach (and the brains behind True Life Coaching). She is someone I turn to for advice and wise counsel in my life. I found the blog post below insightful (after all, who doesn’t have behaviors they’d like to change?!) and hope you do as well. If you’d like to attend the conference (in Seattle), head here for more information. 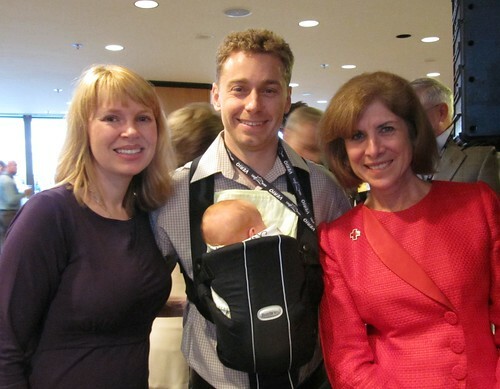 I had a fantastic time at the Chick-Fil-A Leadercast yesterday. Along with thousands of other people on site, and many more thousands around the nation, I enjoyed 20-minute presentations by inspirational business leaders, including John C. Maxwell, Seth Godin, Allison Levine and Suzy Welch. One of my favorite speakers was Dave Ramsey. People matter. Your management team, staff and customers are people. They are not replaceable commodities at your beck and call. Your customers aren’t units of revenue. Your team isn’t units of production. Fire the jerks. Dave gives one warning to employees who violate company policies (including a zero tolerance gossip policy). After that, he invites them to find another job. Be financially fit. Manage your money wisely. Live on a budget. Don’t carry debt. Debt magnifies your mistakes. Embrace a higher calling. You’ll play harder and act smarter by playing for something that’s bigger than you. Dave knows what he’s talking about. A real estate business he once owned was so heavily in debt that Dave was forced to file for bankruptcy. He has turned that situation into a debt free business that helps others avoid getting into the same type of financial situation he had been in. You can learn more about him at his website. I had a fantastic time, and you can check my Twitter stream from May 6 to get some great tips I Tweeted live during the event. You may also enjoy browsing the #cfaleadercast Twitter hash tag to see what others shared. And you’ll enjoy Brian Dodd’s post: 50 John Maxwell, Seth Godin, and Dave Ramsey Leadership Quotes From The Chick-Fil-A Leadercast. Question: What do you think of Dave’s advice? Do you follow these basic principles? Remember how MSN came to video our road to Washington DC? If you want to see the behind-the-scenes blog post, click here. Below is the final product – I love how they worked in my sweet husband and 2 week old baby. Here we are with SBA Administrator Mills. She spoke at every event and was a constant presence and support for the group. Jamisen pretty much conked out everywhere we went. 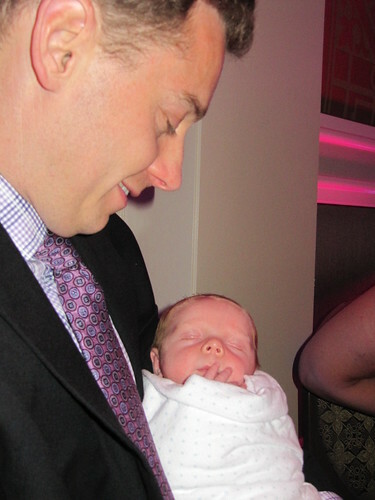 I think the constant movement + Daddy holding him everywhere + the drone of the roomful of chatter really helped to make him sleep. This meant that he didn’t sleep at all at night … much but I don’t blame him. After all, we drug him 3 time zones away, made him go to sleep and wake up in a strange place and had tons of people in his face all the time. The change was bound to show up someplace … and it did, at night. We stayed at the Mandarin Oriental in Washington DC. It was a top notch hotel. They had a crib and stroller for us and even included a little goody bag of products for Jasmisen. Here we are, admiring our handsome Lil Man while getting ready to go to the black tie gala on the last night. The CEO of Radio One spoke at the event and she was a fantastic speaker with an inspirational story. The CEO of the Red Cross spoke to us at the event about the importance of being prepared for any disaster – you can learn more about your disaster preparedness here. She was extremely well spoken and clearly passionate about her organization’s mission. I came away even more firmly committed to supporting the Red Cross with Bramble Berry’s Charitable Giving this year. This is a photo taken at the Mandarin, in our hotel room. 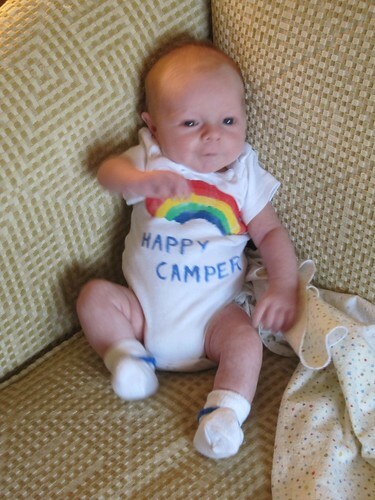 Seriously, how adorable is this little guy when he’s happy? He’s such a cheery little guy (when he’s not spitting up or otherwise miserable from bile) and I can’t wait for his little digestive system to keep improving so we get more and more of these smiles. 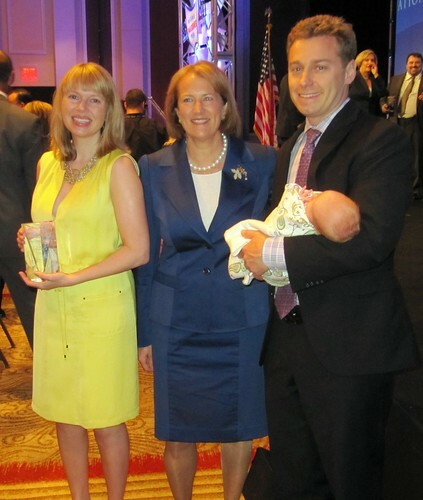 When my husband and I went to Small Business Week in Washington DC (miss that post? 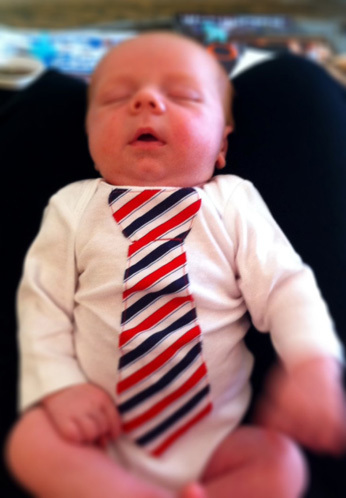 Check it out here – there are adorable baby photo outfits + scandalous politician snubs), Google really went all out for the Small Business Week winners. They served us free espresso drinks in the morning. They provided free computers for us to use for the entire conference at an awesome Google Cafe. And, they served Gelato in the afternoon. If that wasn’t enough, they invited all the winners to tour the Google offices. 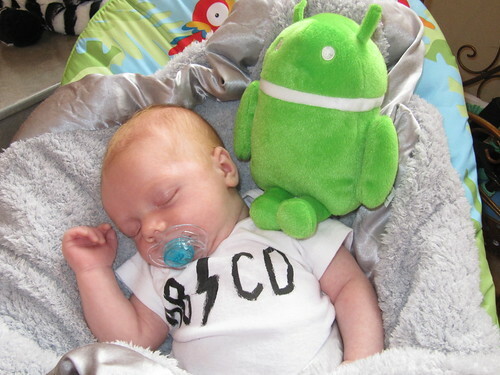 Here’s Jamisen with his Android plush toy the Google team gave him. When we got there, they had a surprise – a Google Chromebook for each and every Small Business Week winner. THANK YOU GOOGLE! Politicians may have snubbed us but Google treated us extremely special and I am thrilled. And, proving that the art of reciprocity exists, I’ve been obsessively using all things Google this week (Chrome, Google Docs, Gmail, Google Places, their new +1 service etc…). 2. Seamless Updates – The Chromebook (which replaced my laptop at home within seconds) updates every day. You never notice it. It doesn’t bother you. And, the updates include all the security fixes etc… so you never have to worry about security breaches. 3. Document Continuity – Because of the way the Chromebook works (it has very little actual harddrive – you save very little to it – it’s all cloud based), you can access your documents from everywhere. 4. Super Fast Opening – It takes 8 seconds to turn on. 8 seconds. I didn’t think I’d care but now, my laptop seems like it takes long enough for me to get a haircut, a manicure and a pedicure in the time it takes to boot up. 1. The Chromebook has a touch pad that is interesting and different in how it works. There really aren’t right click/left click buttons and it takes some getting used to. I am apparently old school, old dog, no new tricks so I’ve plugged in a mouse and that seems to do the trick for me. 2. No “F” keys; you know those F1, F2 keys? They’re gone and instead there is a row of control keys (sound, page forward, page back, brightness etc…). Since I never used those F keys, it’s an improvement but if you’re an F Key Addict, this might be a tough change for you. 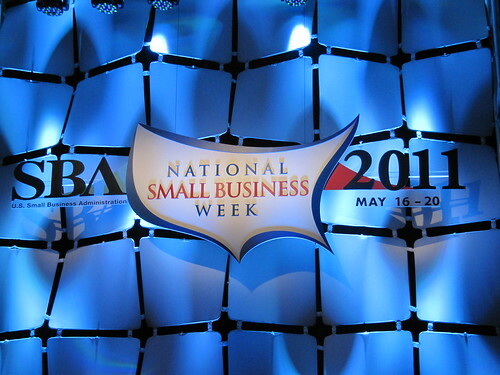 It’s been a whirlwind week in Washington, DC for Small Business Week. 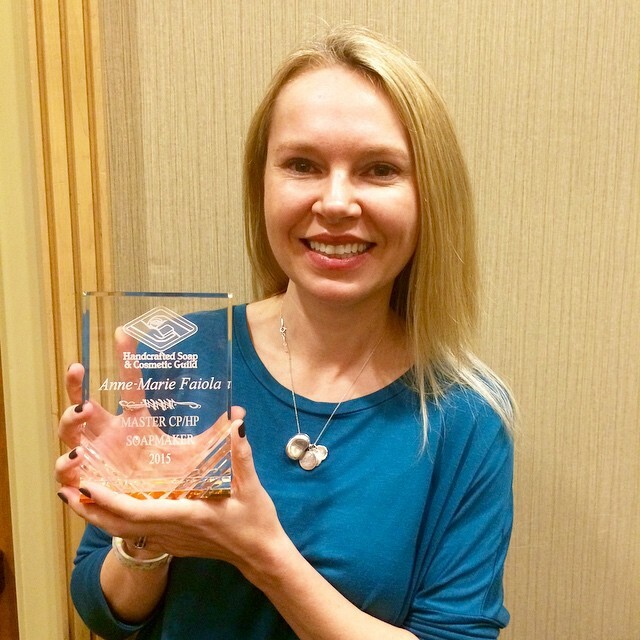 I won Best Businessperson of the Year for Washington State (click here to see that blog post). If you had told me a year ago that I would have traveled across the country, three weeks postpartum with a newborn, I would have told you that you had clearly taken a train to Crazytown. But life has a funny way of surprising each of us, including me. 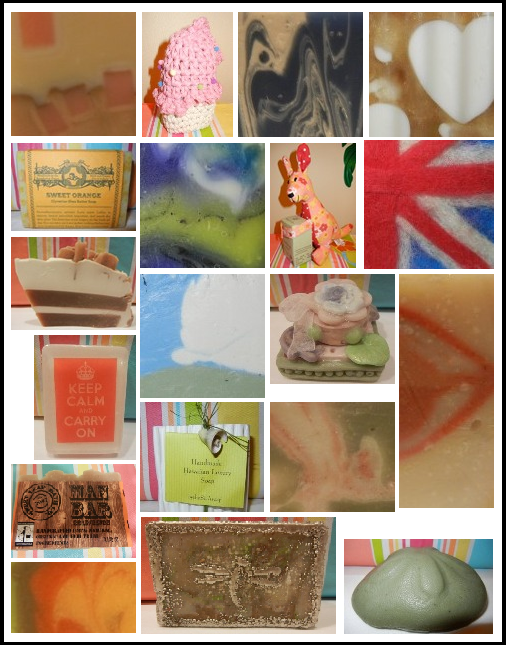 It was hard to choose which soaps to include in the gallery and even harder to vote! I am extremely lucky that I’ve heard some of the best business minds in the country speak over my last decade in business. 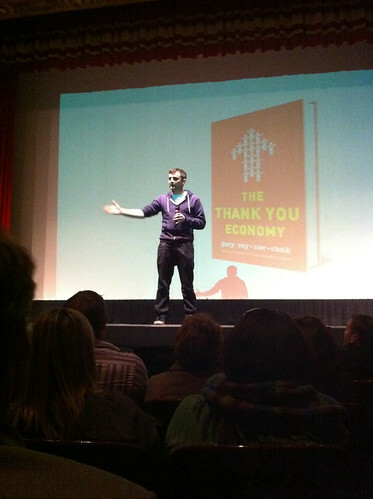 Gary Vaynerchuk is one of those minds. Though his message isn’t rocket science but the way he presents the information is compelling and moves people to action. In person, he’s a bit like Lassie on Red Bull – frenetic, hyper, happy, and wagging his tail because he’s got an audience. Though, to be fair, he did tell us that he would be just as jazzed to speak to 10 people as he was to speak to the 500+ people in the audience last week. * SEO is going social – Google has changed its search algorithms to include social media (this blog, my Twitter stream, Quora – any open systems. Hint: Facebook isn’t open). This means that Google, the largest search engine in the world, will be looking for relevancy. It’s not just about putting a bunch of key words on your page. It’s about who is talking about you, what you said about XYZ product in the last 2 days and on what medium. Keeping up to date and relevant in consumers’ minds remains key for business success but romancing the Google machine will mean that you need to remain active in social media spheres. * Winners do it til the job gets done. – Never. Ever. Quit. Ever. Period. Even in this “new” economy, hard work still has a place. It still matters. It always has. It always will. There is no substitute for a work ethic and tenacity that won’t quit. * Shepherd your new customers. Tend to your old customers more. – Yes, it’s about attracting new customers but more importantly, it’s about saying ‘Thank You’ more frequently and retaining your old customers. Getting new customers costs a lot of money compared to retaining your current customers. * It’s not just about transparency; it’s about authenticity. Never be selling. Always be helping. – Gary talked about how he uses search.twitter.com He just goes on there, sees who is talking about wine and is helpful about wine selections. He doesn’t pimp his own products or website (though he easily could) but rather, he just jumps in and is helpful. And in the end, that will eventually garner him new customers and loyal repeat customers. The art of reciprocity is alive and well. 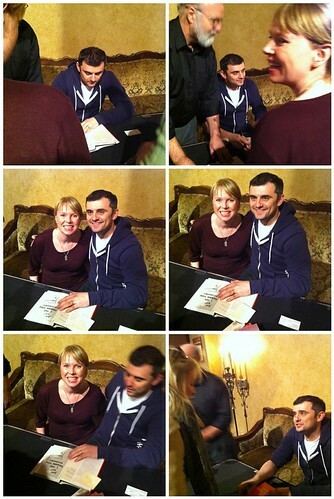 I thought this series of photos was funny – you can see that Gary is extremely focused on whatever is in front of him. Notice he’s moving away while I’m still stuck in the moment, happily smiling for the camera. When he’s focused on you, he’s there 100% but when he’s done, he’s intensively focused on the next person. His charisma is palpable and his smile is quick to materialize. If you haven’t heard of Gary, here’s his website. And, if you’re interested in his new book “The Thank You Economy” (I bought it – I can’t wait to read it! ), more information is here (Amazon) or locally (Village Books).